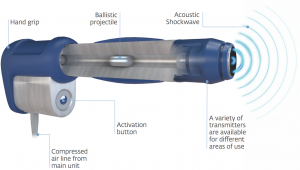 The Buxton Osteopathy Clinic has now invested in new revolutionary Shockwave Therapy. We have made this decision because there is a growing body of good quality clinical evidence that underpins this new exciting technology. This is consistent with our mandate to offer our patients the best possible treatment outcomes using modalities supported by best clinical evidence. Shockwave Therapy is the most advanced non-surgical and non-invasive treatment available for a wide range of stubborn conditions that are difficult to treat using a conventional treatment approach. Shockwave Therapy will preclude the need for steroid injections and invasive surgeries and enable rapid relief from your pain. So What is Shockwave Therapy? Shockwave Therapy is correctly termed Extracorporeal Shockwave Therapy (ESWT). This new revolutionary technology passes shockwaves through the skin to the injured part of your body. These high speed shockwaves are generated by compressed air and are applied by using a hand held applicator. It works by increasing blood flow to the injured area, stimulating cell regeneration and healing and decreasing local factors which can cause pain. Does Shockwave Therapy cause any pain? Most patients experience mild discomfort during treatment, but it is generally well tolerated. The initial discomfort typically fades as the area becomes desensitized as it is being treated. We will adjust the intensity of stimulus depending on your comfort level, and can gradually ramp it up to minimize discomfort. Shockwave Therapy purposefully creates an inflammatory response in injured soft tissue, so you may also experience mild discomfort following treatment. Patients should not apply ice or take anti-inflammatories after shockwave treatment, as this inflammatory healing response shouldn’t be reduced. So What does It Treat? How successful is Shock Wave Therapy? Shockwave Therapy is one of the most widely researched rehabilitation modalities, with increasing numbers of scientific studies added each year. The majority of research validates the effectiveness of extracorporeal shockwave, and shows successful treatment rates of up to 90%! After only 3 or 4 treatments with shock wave, most patients report a significant reduction of pain and regaining of normal function. Shockwave Therapy is so effective it is now recommended by the National Institute for Health and Clinical Excellence (NICE). NICE is an independent body set up in 1999 in order to provide the best evidence based guidance and advice based on research and evidence about which treatments are most effective.